Baking sourdough bread is easy and delicious. This easy sourdough starter is the perfect place to begin with your sourdough baking and it requires no yeast! All you’ll need is some flour and water to get going with this sourdough starter recipe; the surrounding environment will do the rest as the mixture ferments. Sourdough baking is as old as bread baking itself. Before the widespread manufacturing of commercial yeast, nearly all rural bread bakers would have utilized either a sourdough starter or a natural leavening from beer brewing or other sources to make sourdough bread and baked goods. These natural leavening agents have many advantages over the commercial yeast breads but the primary one is the time and fermentation lacking with modern yeast usage. Naturally leavened breads take time to achieve loft and during that time the bread is imbued with organic acids, the grains are broken down into more digestible constituents, and the sourdough bread is given really delicious flavor. All that is needed to create your own homemade leavening is flour and water. Many starters are available commercially and can work but I love the simplicity of catching these wild organisms in my own kitchen. One of the most important things to keep in mind when beginning to delve into sourdough bread baking is that if your starter isn’t working well, your bread will be disappointing. Creating a large yeast colony alongside the prolific bacterial colony is critical to well-risen loaves. Choosing the right flours for your sourdough starter recipe — or switching flours — is important. Understanding the needs of a sourdough starter and how it can be cared for daily or less frequently are helpful. Everything you need to know about baking with natural leavening, including other forms of homemade yeast and gluten-free sourdough baking, can be found in my book Traditionally Fermented Foods. Sourdough starter recipe, day 1: Combine a half cup of flour with a scant half cup of water. Stir vigorously to incorporate air. Cover with a breathable lid and allow to sit in a warm space for 12 hours. Repeat feeding with same quantities of flour and water. This is a no yeast recipe — that flour and water will be bubbly and beautiful in just a week, ready to make a crusty loaf of bread. Sourdough starter recipe, days 2 & 3: Continue feeding starter as above at the same 12 hour intervals. By the third day a bit of life should show up. There should be bubbles. A sour smell will begin to be evident. You should now see and smell signs of sourdough. More bubbles are forming, the starter is growing in volume in between feedings, etc. Time for homemade sourdough bread! Sourdough starter recipe, day 7: Your starter should now be very airy when it hits its peak, 4-8 hours after a feed. Continue feeding as on days 4-6 and feel free to start baking! You have successfully made this easy sourdough starter without yeast. Continue to feed once per day going forward, if the starter sits at room temperature. Alternatively, you can store it in a refrigerator and remove to bake with it once per week. Just be sure to remove it 24 hours before mixing up your dough so you can feed it and let it come to room temperature. And if you’re looking to get started, these Simple Overnight Sourdough Rolls are an easy first baking project. Not ready to tackle sourdough baking quite yet? Try this pillowy soft potato bread recipe! Sourdough bread starts with a good sourdough starter. This sourdough starter without yeast captures wild bacteria. 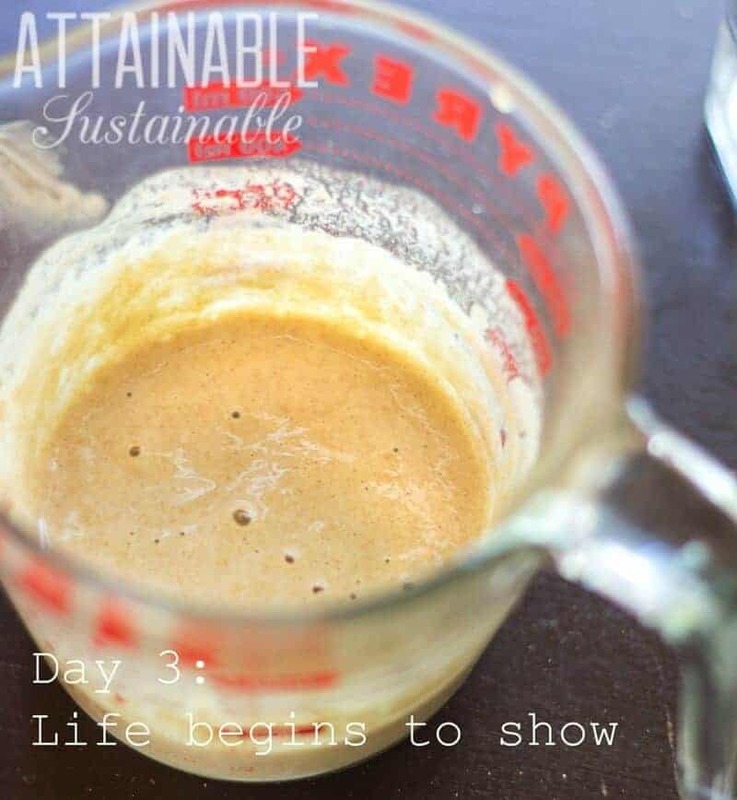 Day 1: Combine a half cup of flour with a scant half cup of water. Stir vigorously to incorporate air. Cover with a breathable lid and allow to sit in a warm space for 12 hours. Repeat feeding with same quantities of flour and water. Days 2 & 3: Continue feeding starter as above at the same 12 hour intervals. By the third day a bit of life should show up. There should be bubbles. A sour smell will begin to be evident. 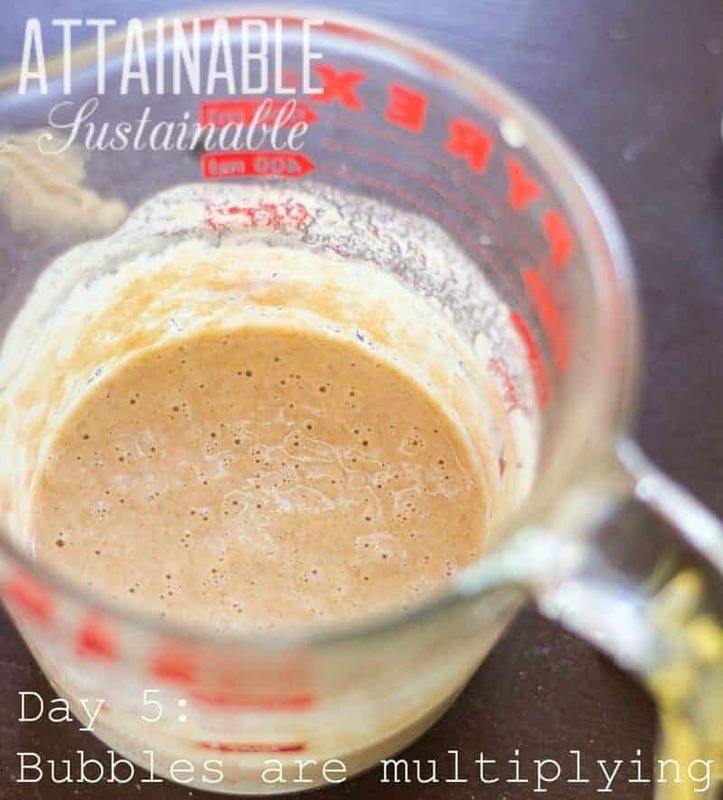 Days 4, 5, & 6: Continue feeding starter as above, but discard all but 1/2 cup of the starter just before you feed it. (There are plenty of good uses for "discarded starter" in the Grains chapter of my book.) You should now see and smell signs of sourdough. More bubbles are forming, the starter is growing in volume in between feedings, etc. 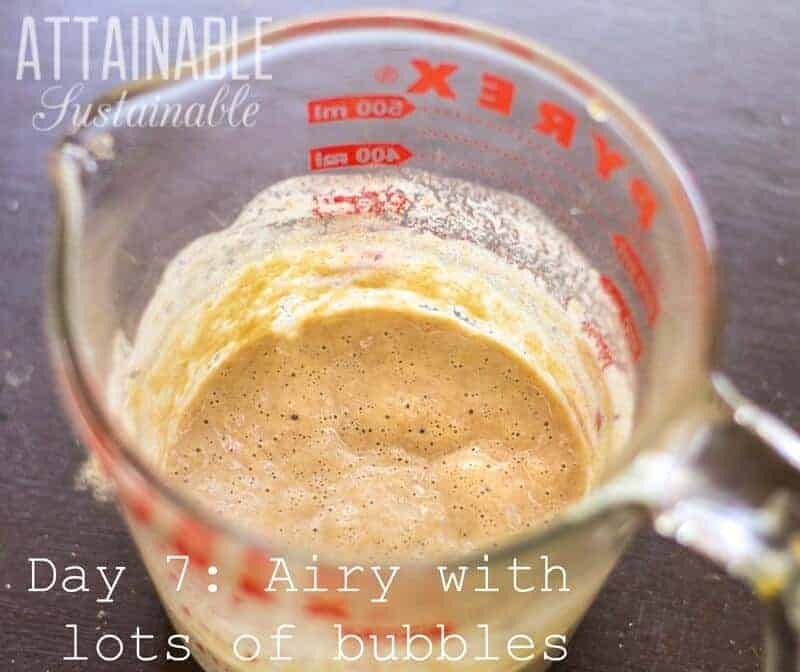 Day 7: Your starter should now be very airy when it hits its peak, 4-8 hours after a feed. Continue feeding as on days 4-6 and feel free to start baking! You have successfully made this easy sourdough recipe without yeast. I have been baking a great bread with freshly ground wheat berries and would like to start using sourdough starter in the place of the yeast. Since the recipe makes 5 loaves at a time, how do I make sure I have enough starter when it comes time to make bread. I only bake about once a month as I keep the extras in the freezer and there are only 2 adults in my home. 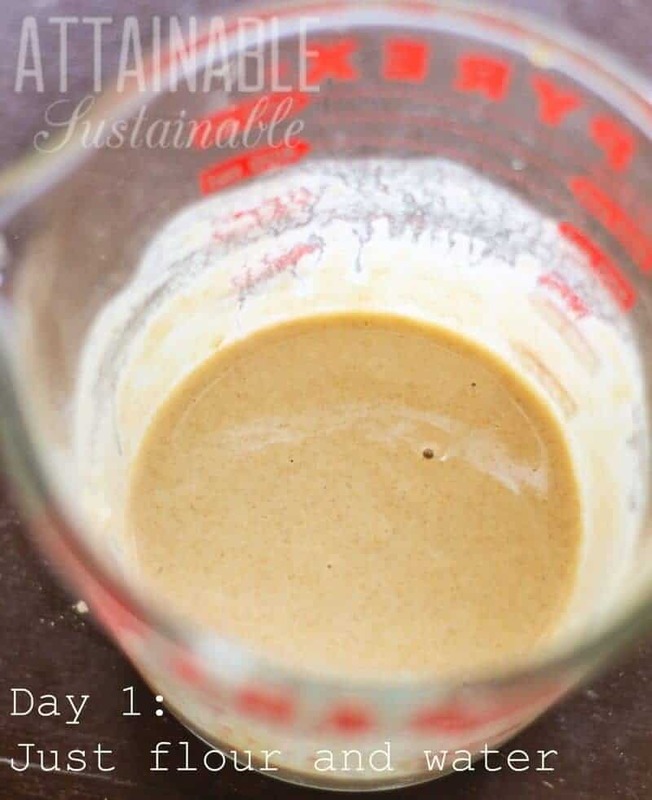 Do you have a schedule for using your sourdough starter? I’m curious how you use it regularly. In the past, I just make pancakes or bread when I feel like it, but inevitable I kill my starter or it gets infected with bad mold. Do you do something like…Every Saturday make English muffins or bagels (make extras to freeze? 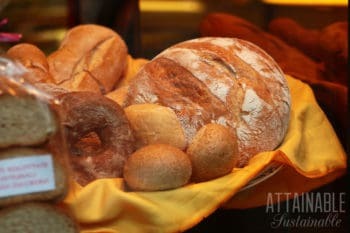 ), Tuesdays bake loaf of bread, Thursdays make another item like muffins or tortillas? How often does one need to use their sourdough if they want to leave it sit out on the counter every day? I’ve seen some people that keep a nice big healthy jar on their counters and seeing it makes me feel happy. I would love to have that at home! One more question…do you have a favorite jar to keep your starter in long term? I put mine in my 1-quart Pyrex measuring bowl to start with, but long term I’ll need that back. Can you use rice or coconut flour or another gluten free flour to make this starter? You can experiment. I’ve not tried it personally. I thought we’re suppose to discard sone each time we feed ?? No?? I’m totally co fused . I have started to prepare it but didn’t feed it for about 3 times , so in total 36 h, is any chance I can still continue or just release it ? I just saw this! How did it go? Be warned: If it’s warm, this may overflow the jar. Good idea to set it in a baking dish just in case! Hi, just curious. For days 4-6 it says to discard it all except for half a cup before you feed it. Is that for every 12 hour interval for those three days, or just at the first feeding on day 4? I’m on day 3 right bow so want to be sure I am doing this correctly! Thanks! Shoot, I’m just seeing this. I trust you worked it out?? Discard when you feed. Hi, what do you mean feed it? Does it mean that everyday I need to add half cup of flour n water to the existing dough? “Feeding it” is when you add the “fresh” flour/water to the starter. If I refrigerate my starter, how long can I go without feeding it? About a month or so. You can also freeze it for longer term storage. I’m on day 3 of this new starter. I used organic unbleached all purpose flour. It’s healthy and looks like a sourdough starter but does not smell like one. A friend gave me some if hers last month; I made a great boule with it. The one from your recipe doesn’t smell right. Any ideas as to what’s going on? Give it a few more days! I don’t blame you! You can use the “discarded” starter in all sorts of baked goods. Stir it into pancake batter, muffins, etc. What is the purpose of discarding part of the starter? The first time I tried making the starter, I did not want to discard half of it. So I started with 6 ozs on flour and water. After 6 days of adding 6 ozs of water and flour I had a beautiful and airy product. I made two loaves of bread and was happy with the result. This time I will use the discarded mixture to make some banana bread or pancakes. Thanks for the simple and well written recipe. Will it work just as good with Spelt Flour? I haven’t experimented with spelt flour, but in other recipes I’ve found spelt to be a fine 1:1 substitute.